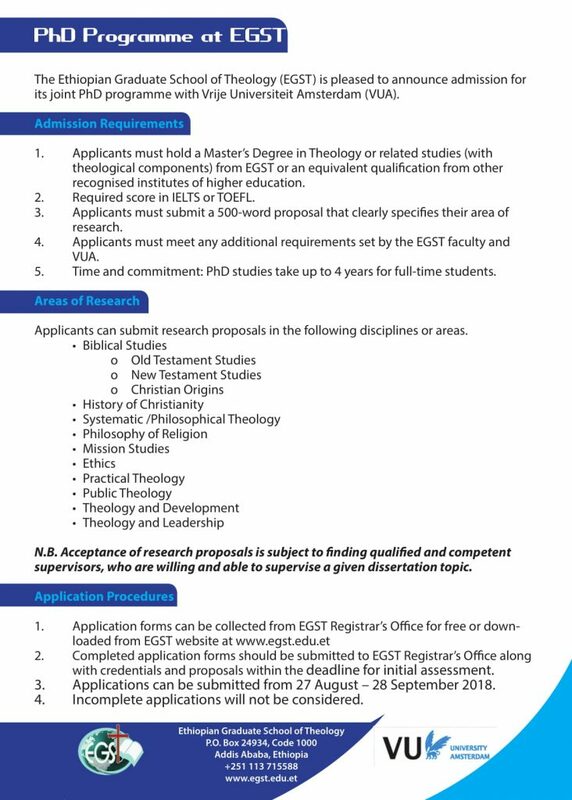 The Ethiopian Graduate School of Theology (EGST) is pleased to announce admission for its joint PhD programme with Vrije Universiteit Amsterdam (VUA). EGST or an equivalent qualifcation from other recognised institutes of higher education. 2. Required score in IELTS or TOEFL. 3. Applicants must submit a 500-word proposal that clearly specifes their area of research. 4. Applicants must meet any additional requirements set by the EGST faculty and VUA. 5. Time and commitment: PhD studies take up to 4 years for full-time students. Applicants can submit research proposals in the following disciplines or areas. N.B. Acceptance of research proposals is subject to fnding qualifed and competent supervisors, who are willing and able to supervise a given dissertation topic. proposals within the deadline for initial assessment. 3. Applications can be submitted from 27 August – 28 September 2018. 4. Incomplete applications will not be considered.